Placed at an altitude of 3775 meters above the sea level, Bhojbasa is a beautiful spot that boasts of an undulating terrain. Translated to the ‘abode of birch’, Bojbasa gets its name because of housing birch tree in abundance. 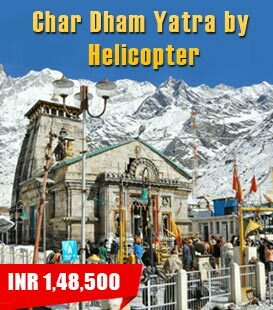 It is actually a vast open piece of land, sandwiched between Gangotri and Gaumukh. It is actually the last place for accommodation, while on the trek to the source of River Ganga, Gomukh Glacier, which is around 5 km away. The 14-km trek for Bhojwasa starts from Gangtori. While at Bhojbasa, you can get some mesmerizing views of the Bhagirathi peaks at 6856 meters where the Gangotri Glacier is also placed. If you are visiting Bhojwasa, you must not miss visiting this glacier and take a dip in the chilling waters. 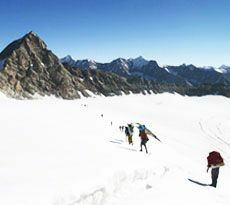 The trek towards the glacier has a number of options- you can go for popular Gaumukh Tapovan and Nandanvan trek, on the way to Bhojbasa. 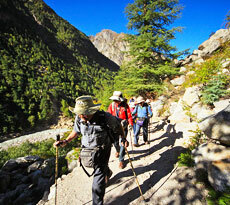 While trekking back to Gangotri from Bhojwasa, you can go 18 km Kedal Tal trek. Another attraction near Bhojwasa is Chirbasa, a beautiful camping site, housing Chir or pine trees. Along with trekking, Bhojwasa is also a popuilar camping site.